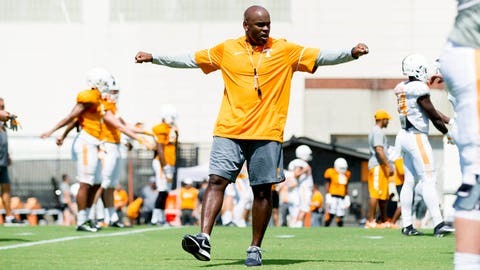 Florida Gators newest assistant Charlton Warren has worked as a defensive backs coach at Air Force (2005-2013), Nebraska (2014), North Carolina (2015-16), and Tennessee (2017) prior to joining Dan Mullen's coaching staff. GAINESVILLE, Fla. (AP) — Florida coach Dan Mullen has added Charlton Warren to his staff. Mullen made the announcement Friday, the same day offensive line coach Brad Davis left Florida to take the same position at Missouri. Warren spent this season Tennessee’s defensive backs coach and special teams coordinator. He spent the majority of his career at his alma mater, Air Force, where he served in many roles during nine seasons (2005-13). Warren also worked as defensive backs coach at Nebraska (2014) and North Carolina (2015-16) before landing in Knoxville, Tennessee. Along with his college coaching experience, Warren also participated in the NFL minority internship program in 2007 with the Houston Texans. He spent training camp with the Texans, assisting with the defense and special teams. Warren is the sixth assistant hired by Mullen, joining strength and conditioning coordinator Nick Savage, defensive coordinator Todd Grantham and offensive assistants Billy Gonzales, John Hevesy and Brian Johnson.